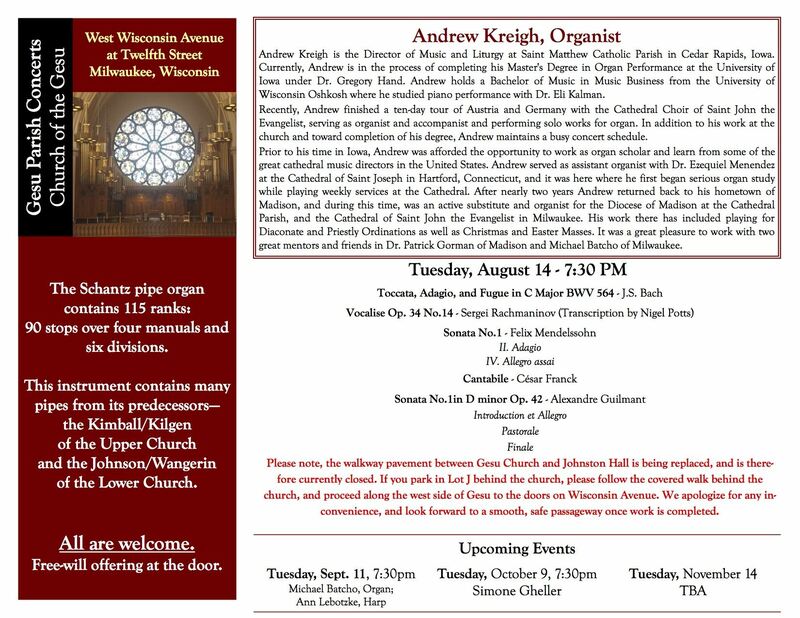 Andrew Kreigh is the Director of Music and Liturgy at Saint Matthew Catholic Parish in Cedar Rapids, Iowa. Currently, Andrew is in the process of completing his Master's Degree in Organ Performance at the University of Iowa under Dr. Gregory Hand. Andrew holds a Bachelor of Music in Music Business from the University of Wisconsin Oshkosh where he studied piano performance with Dr. Eli Kalman. Recently, Andrew finished a ten-day tour of Austria and Germany with the Cathedral Choir of Saint John the Evangelist, serving as organist and accompanist and performing solo works for organ. In addition to his work at the church and toward completion of his degree, Andrew maintains a busy concert schedule. Prior to his time in Iowa, Andrew was afforded the opportunity to work as organ scholar and learn from some of the great cathedral music directors in the United States. Andrew served as assistant organist with Dr. Ezequiel Menendez at the Cathedral of Saint Joseph in Hartford, Connecticut, and it was here where he first began serious organ study while playing weekly services at the Cathedral. After nearly two years Andrew returned back to his hometown of Madison, and during this time, was an active substitute and organist for the Diocese of Madison at the Cathedral Parish, and the Cathedral of Saint John the Evangelist in Milwaukee. His work there has included playing for Diaconate and Priestly Ordinations as well as Christmas and Easter Masses. It was a great pleasure to work with two great mentors and friends in Dr. Patrick Gorman of Madison and Michael Batcho of Milwaukee. Please note, the walkway pavement between Gesu Church and Johnston Hall is being replaced, and is therefore currently closed. If you park in Lot J behind the church, please follow the covered walk behind the church, and proceed along the west side of Gesu to the doors on Wisconsin Avenue. We apologize for any inconvenience, and look forward to a smooth, safe passageway once work is completed.